Who says the color of love is limited to red? Break the mold with this peachy, pink arrangement. 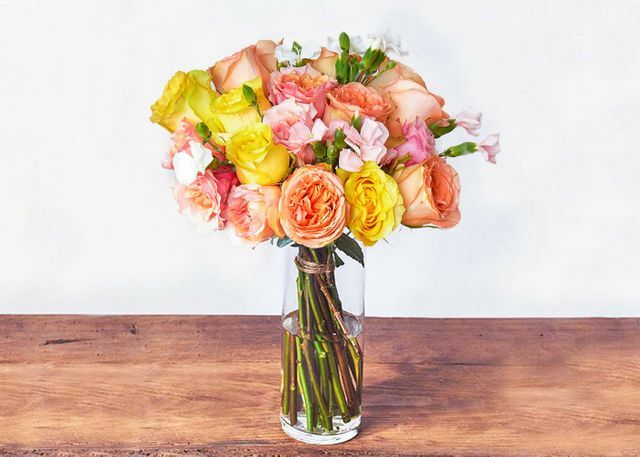 Pops of canary yellow and grapefruit combined with miniature white blooms make this the perfect bouquet for young love or a blooming friendship. PLEASE NOTE - this bouquet will be shipped via Fedex directly from our farm in Ecuador! Garden roses, tea roses, and solomio.